There are many iconic items that can be found at churches: a cross, statues, a painting of the Last Supper. But there are some things you don't expect to see at a church -- like a shopping cart and a plastic goose. For members of First Congregational Church of Rutland and Brookfield Congregational Church, these two items are as fitting as a manger scene at Christmas. Many local churches collect non-perishable items throughout the year to be donated to their local food pantries. Some churches choose to designate a certain Sunday for collecting, while others leave a box in the back of the church for 'anytime' drop-offs. Hoping people remember to bring in their donations is probably one of the biggest concerns to this ministry. First Congregational Church of Rutland, however, makes sure that food pantry donations are foremost in people's minds by leaving an actual bright red shopping cart in the sanctuary. Kathy Highland, a member of the Missions Committee, visited several grocery stores, pharmacies and hardware stores in the community before she found a business willing to donate a cart. It was important to her to have an actual cart for their program -- one that benefits a food pantry at a local Catholic church that serves several area towns. Some people may think it's not appropriate to have a shopping cart in the sanctuary but it provides a powerful image. "It hits home to see a real cart in the church," she said. "You can relate it to your own family when you realize some families can't fill a shopping cart for themselves." "It's a very visual reminder," said Mark McGuiness, a deacon at the church. "People will step up to the plate if asked. This is an identifiable cue that there's a real need in the community, so by seeing that shopping cart, they are considered 'asked'." A big red shopping cart certainly draws attention, but equally eye-catching is a full-sized plastic goose. Paul Shailer, a deacon at the Brookfield Congregational Church, believes the goose -- which is put out at coffee hour -- is very visible and stands out. 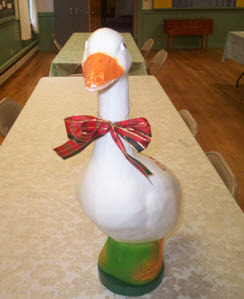 "Gertrude the Goose" (as she has been named by the Sunday School children) has become the church's ambassador for mission donations. "Kids love to put money in its bill and watch it swallow the change," explained Gwen Yaskoski, a trustee and treasurer at the church. "The prop really gets the children involved and they have become very curious as to not only where the money goes after it's eaten by the goose, but who is being helped by the donations." The donations add up to over $500 a year -- appropriately benefiting Heifer International, a nonprofit, organization that provides livestock and agricultural products to help end hunger and poverty. Whether it's a faux fowl or a real shopping cart, unique props can be helpful to mission and fundraising programs.